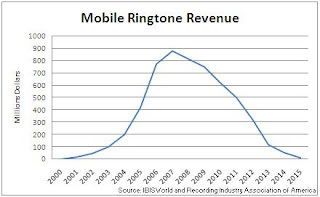 Research firm IBISWorld has reported that the ringtone market will see more double digit declines and disappear by 2015. Given the leap in computing capabilities of mobile devices, this is not a great shock. Still, there are lessons to be learned from the ringtone heyday. Ringtone sales ascended after Napster blew the lid off of p2p downloading. Why would someone pay $2-3 for a portion of a song when they could easily grab the whole track for free? The technology for buying a ringtone was simple. Anyone could do it. It wasn't quite as easy as using the microwave or making toast, but close enough. Before iTunes buying a full song wasn't as easy. On a related note, the user interface of the mobile device was a known entity to the user, unlike some early mp3 players that had overly complex or non-intuitive interfaces. Music is a means for expressing individual identity and mood. The ringtone was marketed as a way to express yourself. It didn't require the same time investment as building a playlist or making mix. It could be changed quickly and easily to match the way you feel, and it allowed for instant sharing of that identity or mood with the immediate public. People will pay for music. Consumers were willing to pay for ringtones because of the value derived from them. Being able to download the full song for free didn't deter interest; it likely compelled it. Ringtones had solid marketing that communicated the value of personal expression and the ease of the technology. Though the market has had a short life, its brief success suggests principles for succeeding with other digital music products.